Prior to being an owner of laying hens I thought all eggs were white and brown. 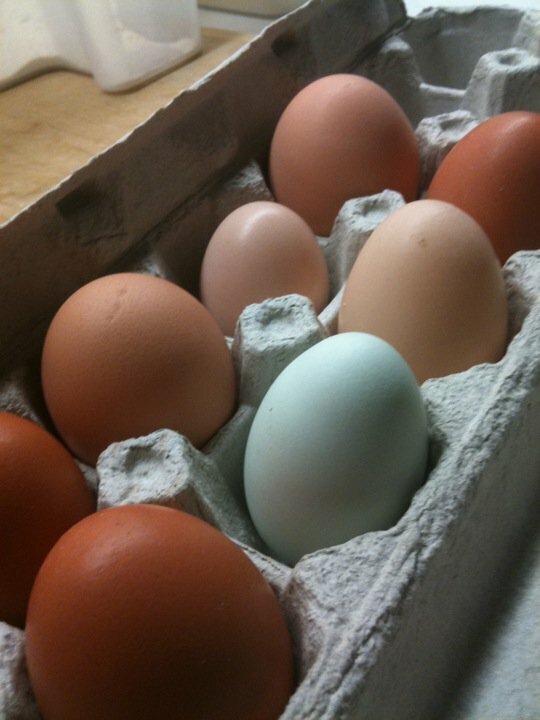 I had no idea that there were dark chocolate coloured eggs, blue eggs, olive eggs, or green eggs. Having said that, Dr.Seuss did tip me off as a child, but I guess I didn't believe it! I never tire of collecting the eggs. It's like each hen gives me a wee gift in the morning, and in return I shower them with fresh greens, homemade breads, and cornmeal. My barred rocks routinely come up to say hello, and they appreciate a head scratch even on the coldest of days. Like a school of fish, they all come running to me as I enter the coop. I simply can't wait for the spring to arrive, so that I can let them out of their winter home - and allow them to run freely around the yard.